Blessed with many springs, lakes, waterfalls, rivers and primary forest, Gia Lai is one of your “should-not-be-missed” destinations whenever you have opportunity to travel along the Central Highlands of Vietnam. Geographically, Gia Lai borders on the North of Kon Tum Province, on the South of Dak Lak Province, on the West of the neighbor Cambodia and Quang Ngai, Binh Dinh and Phu Yen Provinces on the East. Coming to Gia Lai, visitors have a change to discover many impressive, poetic scenes. They are Kon Ka Kinh, Kon Cha Rang tropical forests, Xung Khoeng Waterfall, Phu Cuong Waterfall, Da Trang, Mo springs and Ayaun Ha Lake. Located on the top of an extinct volcano, Bien Ho (To Nung Lake) is called the 'Pearl of Pleiku'. Its water is so clear that visitors can see fish swimming under blue water. The province is also proud of funeral houses, La Phum and D'ko Tu traditional villages with special Rong house. Whenever going to this windy and sunny land, visitors are likely to see the unique architectural style of the statues in funeral houses, and to investigate the local customs and practice mysterious to them. Apart of that, tens of thousands of visitors are attracted to Dong Xanh Cutural Park in which many typical varieties of flowers and trees of Central Highlands are planted. Gia Lai has historic sites such as King Quang Trung's guerilla base, Nup hero's homeland, Pleiku Prison, Pleime, Cheo Leo, and La Rang battlefields. Gia Lai has long history and old ethnic culture, mainly Gia Lai and Ba Na ethnics. This uniquely character stamps of rong house, house on stills, tomb-house statue architectural styles, traditional festivals, customs and musical instruments. 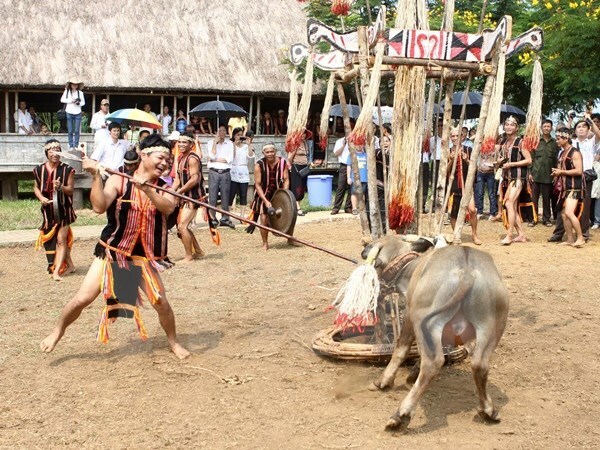 In attractive events like Po Thi (leaving-the-tomb) ceremony, buffalo stabbing festival, xoang dance the ethnic groups show their customs with colorful, mystical pattern, perform many traditional dances and uniquely musical instruments (horn, gong lu, gongs). Buffalo – Stabbing Festival is a popular festival in the Central Highlands, and the most well-known cultural activity in the region. The festival is held at the Communal House. After the praying ceremonies for the deities to come and witness the villagers’ keen sincerity and to receive their offerings, the buffalo is then brought to a column in the middle of the yard, where everyone, young and old, female and male, dance to the sound of gongs. A buffalo-stabbing group, which consists of young strong men armed with cold spears, appears and the buffalo stabbing ceremony begins. The villagers kill the buffalo, which is sacrificed to Giang (God), and then they celebrate with a big feast. The Buffalo-Stabbing Festival usually lasts for two or three days on special occasions for the villager or household. The whole community happily participates.